Flex sensors are fab: these cheap strips send varying voltages when you bend them, seen in use in projects like Eric Singer’s sonic banana (basically, a bendable tube for triggering sounds). The trick is turning that flex data into something useful. Hypersense Complex is a three-person collaborative working on new musical interfaces, and they’ve been nice enough to post details of the hardware and software they’re using. Hardware — all cheap, off-the-shelf stuff you can play with, too. Software — they’re doing fancy Python script interpretation to turn gestures into music in the free sound app SuperCollider. Check out details, sounds, and gallery. 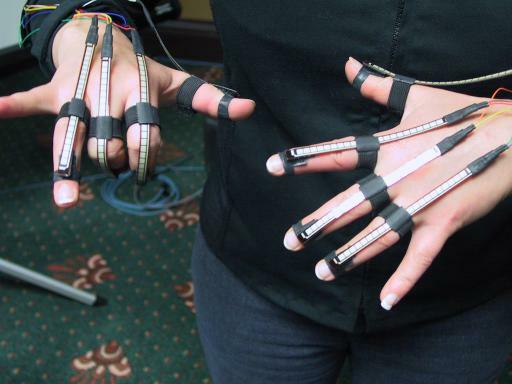 Not much aesthetics to their flex sensor glove — any fashion designers out there? But the exploration of musical gloves continues. Via Turbulence.org’s networked_performance blog.